2013.0 :: March 2012, Revit 2013 ships, and so do we, with new and improved workflows! 2013.2 :: December 2012 - Top 3 user requests added plus many improvements. 2013.5/2014.1 :: Give us a bit of time, we just got your feedback! In addition to some great ideas about how to make Ideate BIMLink even more useful, users are reporting an average of ***23.7 hours saved per project***, meaning that for most customers they re-coup their initial investment within the first project. Sign-up for online training to learn how you can make the most of Ideate BIMLink. Missed the survey? You can always provide your input from within the Help menu. A few weeks ago we gave a gentle nudge to BIM Managers to take the courageous step of actually executing on their workset plans. That post generated a lot of positive feedback and discussion. Including this follow-up question. 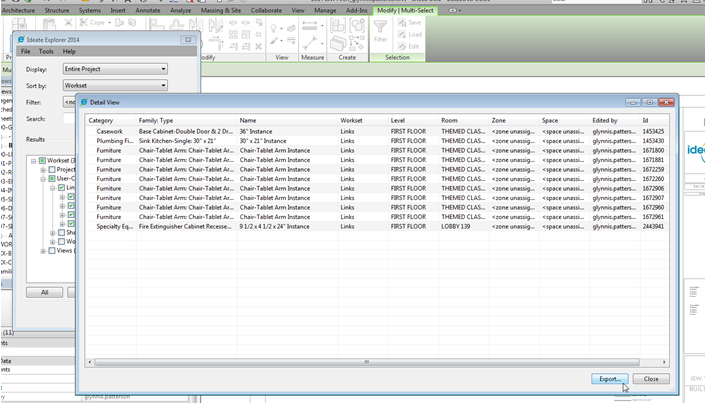 Q: Can I use Ideate Explorer for Revit to generate a list of elements per Category or by Workset for offline review? Try the Ideate Explorer for Revit Free Trial today. Are You Executing on Your Workset Plan? You've spent the time to devise a great way to organize your Autodesk Revit project with worksets. Your plan is excellent and will decrease time wasted opening unnecessary information and ensure that only the desired information will be printed within the deliverables. BUT½ are you actually executing on this plan? Ideate Explorer for Revit knows, so take a peek at your project today and be sure that you are executing on your workset plan! Get your hands on the Building model, you own it, right? Open up Revit (trial version works fine - get it here). 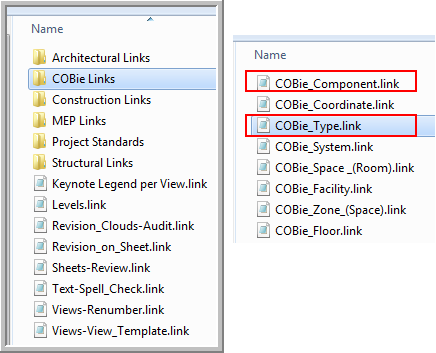 You launch Ideate BIMLink and you export the COBie_Type and COBie_Components to an Excel file. Whether you intend to do COBie or not these links are a great way to quickly get all of the asset list that you need to get started. If your budget permitted, you required the model to be updated to reflect as-built conditions. Congratulations, you get to skip ahead to Step 7. If the model does not reflect the as-built conditions then you should pay your architect and engineers to fill out the Excel files from step 4 above or have your own staff fill out any missing info. This can be done with a tablet as outlined in this earlier post. Congratulations, you now you have a complete list of all the building assets for use in managing the building's maintenance and operations. That was easy! Glynnis is a Registered Architect and has worked within the BIM industry since 1998. A graduate of Carnegie Mellon University, she has worked as an architect, educator and construction site manager. 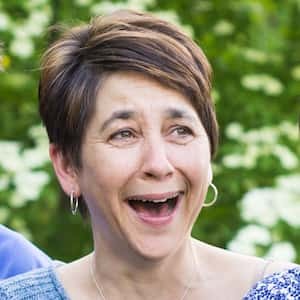 Glynnis is currently the Director of Software Development Services at Ideate, Inc. and continues to work with AEC clients worldwide, developing, and consulting on solutions to Building Information Modeling challenges. In her spare time Glynnis does volunteer work for ECLC of NJ and Grow it Green Morristown. Follow Glynnis on Twitter. Did I Link or Import the CAD file? Was the box checked for "Current view only" selected or not? Within the Revit products the only way a user knows if the "current view only" option has or hasn't been selected is when the CAD File shows up in a view other than the inserted view. That is of course, as long as a team member hasn't turned it off with the various Revit graphic tools. Ideate Explorer informs the user through separating out the CAD files into DWG File or DWG File whether they are linked or imported. DWG File = CAD Files found in this section informs the user that these CAD Files may be found in multiple views because the "Current view only" option wasn't used during insertion/linking. DWG File = CAD files found under this section informs the user that these CAD Files can only be found in the view that they have been inserted in, or there was a check in the box for "Current view only". Where is it! It wasn't exploded was it???? 1. Searching for symbols = Within Ideate Explorer CAD Imports category I look for DWG files that repeat multiple times with symbol name at the end. 2. Search for Line Styles - Within Ideate Explorer I look at the Lines > detail Lines category looking for CAD Layers names like DEFPOINTS etc. Ideate Explorer can quickly find elements in the model like imported CAD Files. Ideate Explorer has a Show Elements tool which when selected will zoom to the item in Revit that you've. This is similar to the "Highlight in Model" function in Revit schedules. Users can access the Show Elements several different way. My favorite method is as follows: • Select an element in the Results window. • Select the Show Elements (Zoom to Selected) button from the Top right of the Results window. Happy searching! If you would like to make suggestions on what you would like to see in future releases of Ideate Explorer for Revit send us your ideas. Eugene A. O'Day, IX - AEC Application Specialist Eugene A. O'Day, IX, with more than 25 years of architectural and mechanical experience, offers a trained focus on all things Revit and BIM. Teaching is a passion of his. Eugene has been an instructor in undergraduate degree programs, has traveled worldwide teaching Autodesk solutions to major corporations, has taught at accredited ATCs throughout the Northwestern region, and is a frequent and popular instructor, speaker, and presenter for AUGI® CAD Camps, Revit - and related product user groups. He has also been a trusted public school district advisor on new drafting instructor hires. At Ideate, Eugene provides training and support for Revit Architecture, Revit Structure and AutoCAD. Eugene is also a Revit Architecture Autodesk Certified Professional.